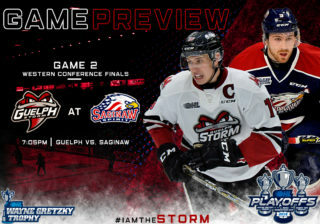 Game Preview: Storm ready for round 2 of Highway Seven feud! 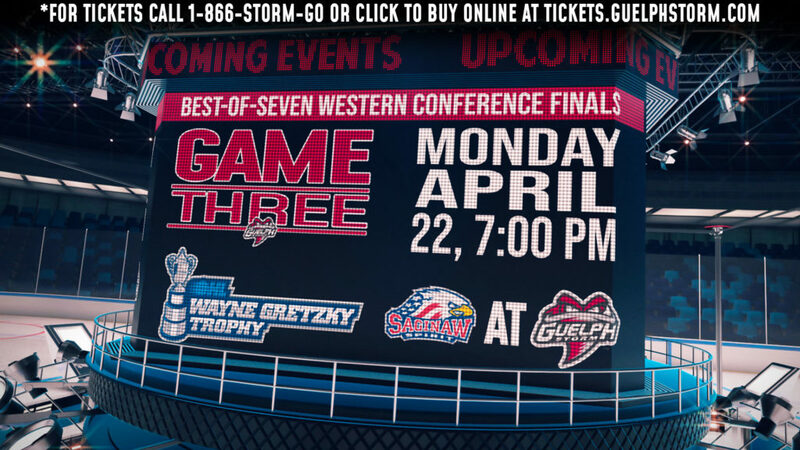 The Guelph Storm look to put an end to their five-game losing streak with the Kitchener Rangers visiting for a 2:00 p.m. puck drop on Sunday. The game also features the annual Wellington Motors Food Drive. For more information on the Wellington Motors Food Drive, click here. For Storm fans who purchased a ticket to Friday’s game against the Erie Otters, there’s the chance to add a ticket to Sunday’s match-up against the Kitchener Rangers for only $12! Don’t miss a second of the action and get your tickets now! After a tough result on Friday night versus Erie, The Storm (3-5-0-1, 5th Midwest) will look to take the positives from that game Sunday’s action versus the Rangers (5-2-0-1, 2nd Midwest as they attempt to snap their five-game losing streak. 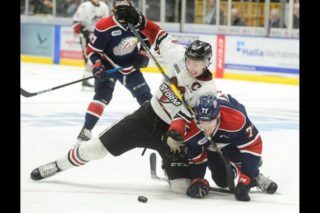 The Rangers will be looking to bounce back from their loss on Saturday night at the hands of the Owen Sound Attack. Saturday night’s loss marks just the seconds regulation loss for the Rangers to start the season. Puck drop is slated for 2:00 PM. It’s been a tremendous start to the season for Matt Hotchkiss who continues to lead the team in scoring with eight points (3 goals and 5 assists) through nine games. Hotchkiss has flipped the script from last where he struggled early on, only registering three assists in his first 26 games. Currently producing 0.89 points per game, the Whitby native is quickly approaching his career highs set last season. Leading the team in goals is the rookie sensation, Nate Schnarr. After scoring on Friday night, Schnarr already has five goals through just nine games, three of which came on home ice. 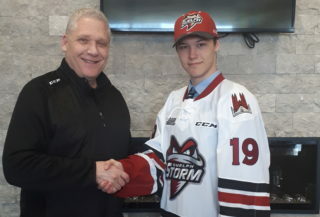 The Waterloo native is quickly garnering attention across the league in his first OHL season, and will look to build off the early success. 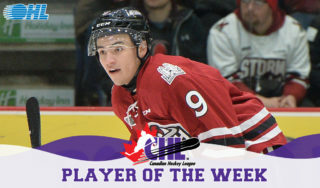 This past Monday was a special day for the rookie defender, Ryan Merkley. The Mississauga native scored his first career goal in his Highway Seven debut, and he hasn’t stopped there. Playing with great poise at just 16 years of age, Merkley has been all around the net as of late and will get another crack at beating the Rangers on Sunday afternoon. One of the Ranger key contributors in Monday’s win over the Storm was Toronto Maple Leafs prospect, Jeremy Bracco. Recording three goals and two assist in his first-star effort. The New York native has scored in every game this season with recording at least three points in five of his six games. The Storm will have their hands full as Bracco has found the scoresheet in every game versus the Storm. Guelph native, Connor Bunnaman, makes his return to the Sleeman Centre in his third OHL season. 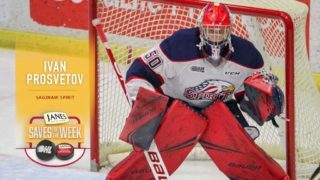 The Flyers prospect is off to the best start of his OHL career highlighted by his three-point game versus the Sudbury Wolves and a two-goal performance versus the Storm. It’ll be a big game for the hometown forward. The Rangers line-up also features a 17-year-old rookie in Greg Meireles. The Orleans native has been outstanding recording 14 points (4 goals and 10 assists) through his first eight games, highlighted by his four-point night on Friday versus the Saginaw Spirit. In that time, Meireles has failed to register a point just twice.